I love me some Boylan's! The black cherry and cola are awesome. If you like the root beer, their red birch beer is really good too. It's like a liquid wintergreen Lifesaver. Finishing up my tin of GLP's Embarcadero in a MM Washington 5th ave. I have tried Boylan's Birch Beer, but I haven't seen the red version. If I find it, I'll give it a try.
' 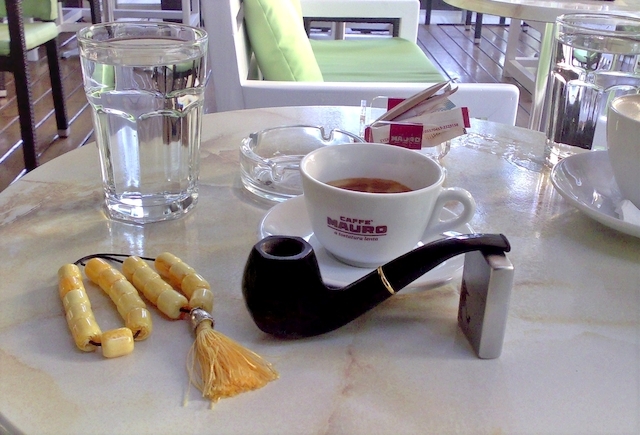 Dayyy from Greece, as you have seen in hundreds of phtoso the coffee is the "necessary accompaniment" in my pipe smoking so take a look what created in the final step of preparation. This is not just another crema for coffee...this is coffee poetry! I fixed the tv-antenna on the roof so the wife's whimpering stopped so calmly i enjoy Robert McConnell Latakia Flake while watching Vietnam war documentaries. Sid, looks like you have that technique down pat. Lovely looking crema! I have an ibrik that looks much like that. Need to put it to more use someday. OGS after b'fast, which the estate Sav 316 Oscar Lucite seems to be dedicated to. Late morning saw some awesome PC burned in my estate Brebbia 'bash. Terrific combo. Mid afternoon on a rainy day, I sacrificed some Thanksgiving blend in the huge Moretti Dutch gifted me. I'll have some St. Bruno RR after supper in the trusty Wily Rhody/Dub. Relaxing after a terrific pot roast dinner with a bowl of 1960s John Middleton Crosby Square in a smooth straight 1980s James Upshall Walnut pot with a black vulcanite stem. Watching a panel discussing the history of public affairs programming in the 1970s on C-Span 3. Smoked Carter Hall throughout the day. Now smoking Dunhill Aperitif in a Savinelli 320 Christmas pipe. Part way through this bowl of 2013 Capstan Blue in a straight sandblasted black billiard 2013 PSF POY Kaywoodie with an amber colored lucite stem. A quarter of the way through this bowl of Watch City Deluxe Crumb Cut in a 2016 Peretti's M.T. 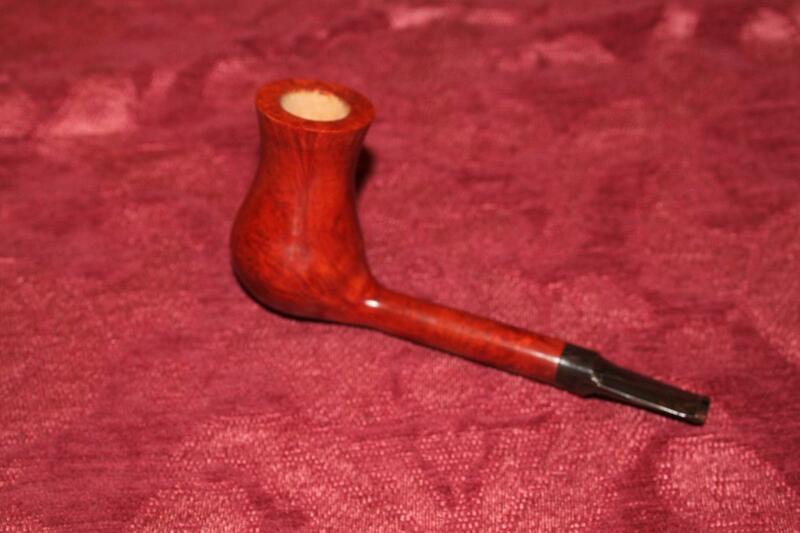 Natural made in Holland straight smooth brown Algerian briar billiard. Have enough left for a couple bowls. Watching Mannix. C&D Odessa in my cuspidor stack. Doesn't even gurgle. Just past the half way mark on this bowl of Uhle’s Bishop’s Move in a 1949 medium bend Dunhill Shell with a black vulcanite stem. Sophisticate in a Falcon with a Dublin bowl. Almost a third of the way through this bowl of RO Perique Series Blend P-37 in a smooth straight early 1960s Lane era William Conrad Charatan Executive Extra Large stretch apple with diagonal channel cuts on the lower right and left of the bowl along with a black vulcanite double comfort stem. Watching a documentary about Sam Giancana. Greetings from Greece, wonderful sunny day with 21°C in Athens. 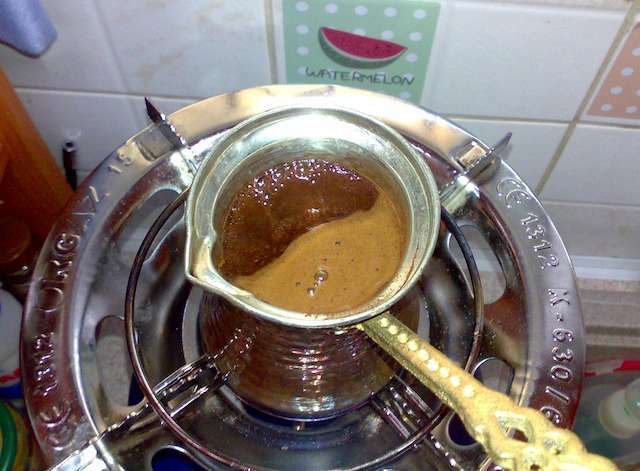 Thank you my friend, keep in mind that the coffee must be thin as powder to get the most of the good reult. Beautiful picture as always Sid. I always look forward to seeing your daily offerings from Greece.